where are the ones that do not lie? The very first pantoum I wrote was for one of Jane Dougherty’s challenges in March 2016. It was inspired by my co-blogger Nina’s drawing, above. Since dVerse is featuring the pantoum form for the month of March, I thought I would begin with a revision of that first one. You can see the original here. I also did a collage to illustrate it. In 2016 I did another pantoum for one of Jane’s challenges. That one could use revision as well, and I hope to give it a try. Last year I was stuck in circles, and posted 9 pantoums. I’ll link to some of them as the month goes on. So I’m looking forward to a March full of new attempts–thanks Gina! Mek at Work in Progress (10000hoursleft) recently received the One Lovely Blog Award and invited us to also post 7 facts about ourselves (3 1/2 each). Luckily we each have half a fact that works with the other to make one! Kerfe: I begin every morning with coffee (cream, no sugar) and Brown Cow vanilla yogurt with fresh berries (blue, straw, black or rasp). I like iced coffee in the afternoon and herbal tea before bed. Nina: I was skipped twice in elementary school thereby missing the basic facts of mathematics. To this day I count on my fingers. I was always the youngest kid in the class and graduated high school at 16. Nina: One of the times I got skipped was (I think) because of a drawing I did of Kate Smith sitting on her moon and singing “when the moon comes over the mountain”. I wish I still had this drawing and for that matter I wish I had all the drawings I’ve ever done. Kerfe: I was voted “most artistic girl” in my senior class of high school. But I really always wanted to be a cheerleader. Kerfe: My first job (after babysitting) was working for my older brother at the University of Maryland, where he was a student employed in the physics lab. I can’t remember how much I made, but they couldn’t find any college students willing to take the job at the salary offered, so it couldn’t have been much. My brother asked me if I would like to try, so I worked on Saturdays during the school year, and during the summer between my sophomore and junior years of high school. I measured data graphs with an instrument that traced the contours, doing several readings of each to make sure they were correct, and typed punch cards for the computer (this was 1968). We lived in Bowie, Maryland, at the time, which was near the University, but moved out of working range in the middle of my junior year–thus ending my career in science. Nina: I’ve been playing the guitar since I was about 12 years old. That would make it around 56 years of more or less playing the guitar all the time. I bought a Martin with babysitting money; it’s a small parlor guitar and not worth a lot of money but it’s my favorite possession. It never goes out of tune. Nina: I received a BFA from the University of Cincinnati in 1969. Kerfe: I attended the University of Cincinnati in 1970-71. I was a student at FIT 1971-73, graduating with an AA in Fashion Design. Nina: I received an AA from FIT in 1974. The universe finally got its timing right around 1975. We were both employed as textile designers at Fair-tex Mills, Kerfe in knits, and Nina in prints. A friendship was born! Our Wordpress avatar, above, which you may recognize, was put together from drawings we did of each other in 1978 (Kerfe by Nina on the left, and Nina by Kerfe on the right). The drawings that start this post are our 2017 updates, 40 years later. We look just the same, right? (or maybe even better). Nina and I alternated lines in our consultation with the Magnetic Oracle this week. My art is a monoprint on rice paper with tissue paper “glued” into some of the paint–I used it quite liberally for this one. We have a sunny cool day here in NYC…hope you are relaxing, rain or shine. Kerfe and I did a quick collaboration. Short and sweet and we both were happy with it. Happy Saturday! When Nina posted her July landscape, below, she talked about possibly meeting with the Magnetic Poetry Oracle. I loved her painting so much I did a collage response, and met with the Oracle myself for some poetic commentary, using Colleen’s poetry prompts for this week as well. We have done a number of these collaborations in the past, but not recently. 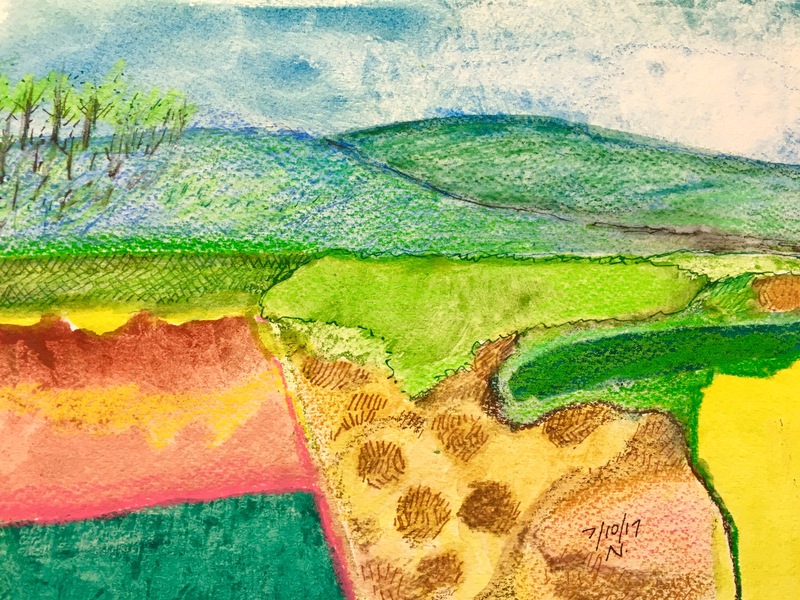 I love especially Nina’s landscapes, which always give me a lot of fertile ground for collage. It’s Saturday! The Oracle is ready and waiting. This was another collaboration with Nina and the Oracle that fit together really easily. We decided to surprise each other today with our artwork and post separately. I punched holes to embroider on the paper, and then decided just to leave the holes. The weird light is because I photographed the collage taped to the window so the sun would shine through the holes. I spent one sleepless night last month doing one magnetic poem after another. I haven’t looked at them since, but I’m sure there’s plenty of raw material to play with once I get around to it. This poem started as a collaboration between Nina and me, but she gave up, saying she couldn’t see where it was going. I tweaked it over a few days, so I don’t know who contributed what–a collaboration, still, even if I had the final say. And another Rorschach painting underneath. The oracle was generous to us this week. A three-way collaboration: O.N.K.